When planning our weekly dinners (yes, I am actually doing this now in an attempt to be organized), my husband ALWAYS requests this delicious, easy chicken dinner. In fact, this is his FAVORITE dinner so I figured I had to share the recipe with you all. This recipe was given to my mom from her friend Rose, so we have unofficially named this dish “Rose’s Chicken”. I can’t even tell you how easy this is to make. Prep time is less than 5 minutes – it is so insanely EASY…. even with a kid (or two) hanging on your leg. Ahead of time: Marinate chicken breasts in Ranch dressing for at least 2 hours. 1. Empty bag of spinach into casserole dish. This will seem like a TON of spinach, but it will wilt when cooking. 2. 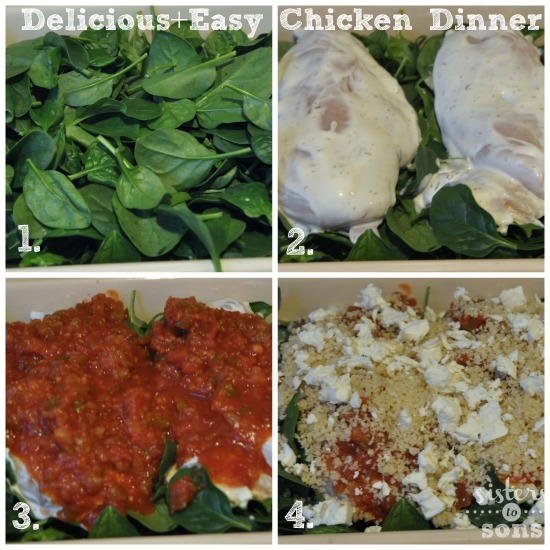 Shake excess dressing from chicken breasts and lay on top of spinach. 4. Top the salsa with the buttered bread crumbs (melt 1-2 tbsp of butter and mix with breadcrumbs) and sprinkle either feta or goat cheese on top. 5. Bake uncovered until chicken reaches internal temperature of 165 degrees (typically 45 minutes depending on thickness of chicken). And that’s it! My husband’s favorite easy chicken dinner – totally man-pleasing. Oh, and I think it’s pretty great too. I have also tried this with frozen spinach and it works! Substitute fresh spinach with an entire bag of frozen spinach. Do not thaw. Place frozen spinach in dish and follow remaining steps. For more Sisters to Sons recipes click here! In other news…. 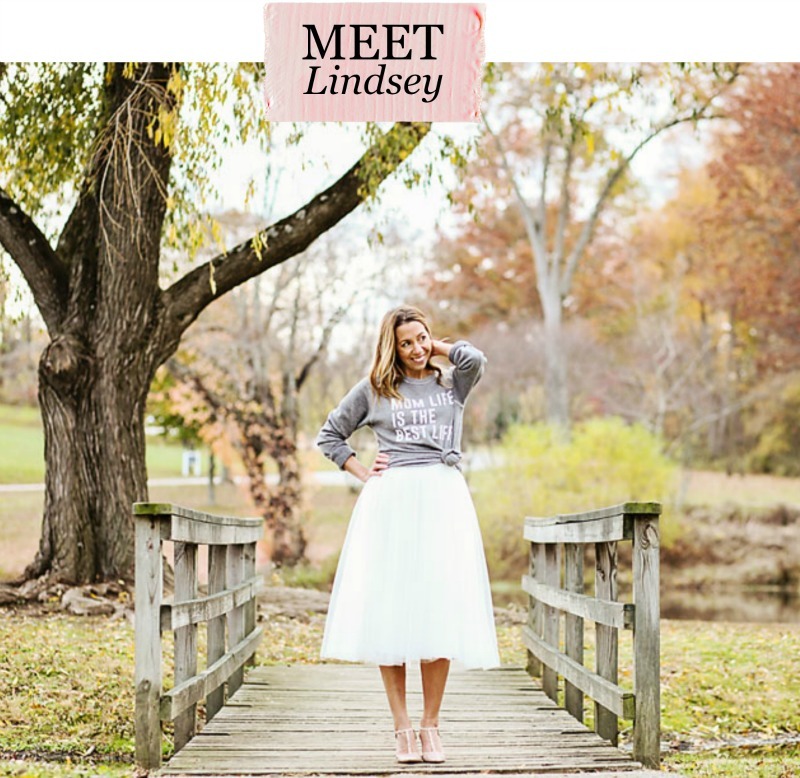 did you see my post on SCARY MOMMY today?? An exciting moment for this little blogger! Yummy!! I’m adding this to our meal rotation! That looks so good! I need to make that for my husband for one of our stay-at-home date nights! This sounds so good and so easy! I think I’ll make it tonight! That’s a good idea! Let me know how it turns out! We love salsa so I’ll have to give this recipe a whirl. I never would have thought to combine ranch and feta cheese together but I’m sure the ranch makes a creamy marinade. Yes, I know! You really don’t taste the ranch at all. Sounds delicious! Rumor has it there’s an awesome dairy-free ranch dressing recipe on Pinterest, I have to check it out so I can try this. This would totally kick up my Salsa Chicken. i don’t like ranch dressing on salad but I like adding it to recipes, it gives great flavor. That looks so good. My family loves chicken, so I am going to see if I can add this to our menu! Can never find too many things to do with basic chicken! Thanks! I make this all the time! So easy and delicious!! Thanks Linds!